Bourbon is making serious inroads into Australia these days. Not that bourbon never was here but rather being taken more seriously as a premium product. Ok yeah Bourbon and cola tastes great and is a marriage mad in heaven but it is not the be all end all. of how it should be considered. The spirits companies have been their own worst enemy in Australia, setting this view point that Bourbon should be consumed with cola as the primary message. Well if you are a regular ready of my posts you will already know I have a soft spot for bourbon as do most of our club members. As always I say step back, take another look, and reinvigorate your appreciation for Bourbon. And where can you start? 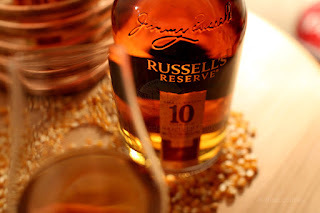 Why not jump in to Russell’s Reserve Small Batch 10 Year Old Bourbon. Russell’s Reserve, as the name suggests, is the bourbon that celebrates the family name and the Wild Turkey icon Jimmy Russell. Like all Wild Turkey products this is a premium product but unlike the other family members is declared small batch in production. Each batch is about 150 barrels specially selected then married to create the Russell’s Reserve Signature taste. Though the barrels are selected on an individual basis the original spirit off the still is exactly the same as what you will find in all Wild Turkey. The grain is the same, the mash is the same, the yeast which is over 40 years old is the same, the stills are the same and of course the warehouses are the same. It is simply the ageing of the spirit in the barrels that deliver the most characteristic changes. Aged at a minimum of 10 years Jimmy feels this is as far as bourbon spirit should be aged while delivering the zenith of Wild Turkey flavours. 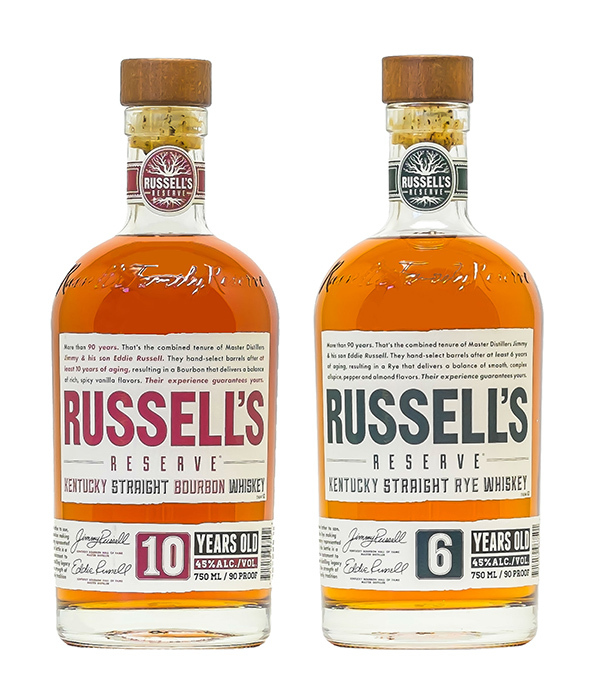 On the shelf the bottle is solid and squat making it very clearly different to the regular Wild Turkey releases. Directly above the table you will spy raised lettering displaying Jimmy Russels signature. Jimmy never really wanted a bottle named after him so for the collector it is worth noting that Jimmy’s signature has now been removed from the bottle. Jimmy wants this to be just as much about his son and family as it is his and the fact is it is both Jimmy and Eddies creation. According to a discussion I had with Jimmy Russell back in July 24th 2015, the signature will be replaced globally with the line ‘Russell Family Reserve’. Of course the flavour profile will remain exactly the same. Here in Australia there is still a mass of the old bottles getting around so snap them up while you can as the design has been significantly amended. 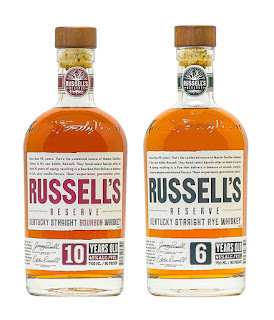 Backing up on the change to the bottle we will also see releases of the Russell's Reserve 6 Year Old Rye, Russell's Reserve Single Barrel, and Russell's Reserve Single Barrel Rye. The man himself Jimmy Russell is a loveable chap, always willing to give you an ear and listen to what you have to say and ask. 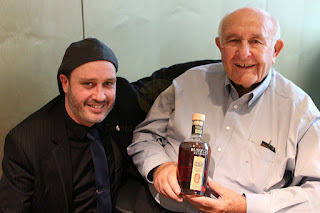 I discovered a lot of things about Jimmy and Wild Turkey during our interview so without repeating, If you would like to find out more about my interview with Jimmy Russell, then head on over to my article on Dramnation: An Interview With Jimmy Russell - A Humbling Experience. Nose: Sweet rich oak vanillas, saturated oranges and warm buttered popcorn. A spice of mild fennel and peppercorns lurks. Taste: Super rounded, fruity with rich vanilla on initial taste. As the whiskey moves into the palate sweet toffee and smooth buttered corn kernels with some high grain nippy on their heals. Finish: Long and warm with mild spicy oak tannins that delivery a earthy texture. A grain element sits in the high points with fleshy fruits in the mouth before the finish extends with a soft dryness. Overall a great value small batch bourbon. At just over $60AU a bottle you cannot go wrong with this whiskey. If I was to give a dram 6 out of 7. I really enjoy this whiskey anytime of the year. There is much to appreciate with this bourbon and the value for money is perfect. Get out and try it if you have not already and remember those older bottles will be disappearing from the shelves very soon.